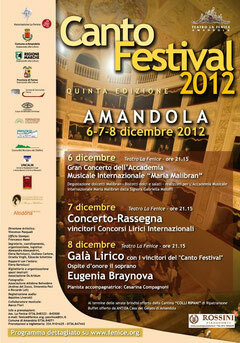 The fifth edition of Amandola's Canto Festival will be held on 6, 7and 8 December, 2012 in the beautiful La Fenice Theatre. The first night will be a concert given by students from the Maria Malibran International Music Academy. The concert will be followed by a degustation of biscuits and sweet wine in the theatre's small, private bar. The second concert will be a selection of varying types of classical singers - soprano, tenor, contralto etc - all of whom have won international opera singing competitions. The third and last night there will be an Opera Gala with guest of honour being the mezzo soprano, Anna Rita Gemmabella. La Fenice Theatre is gorgeous and very atmospheric so, combine it with some great music,and the Canto Festival should be a very special event.